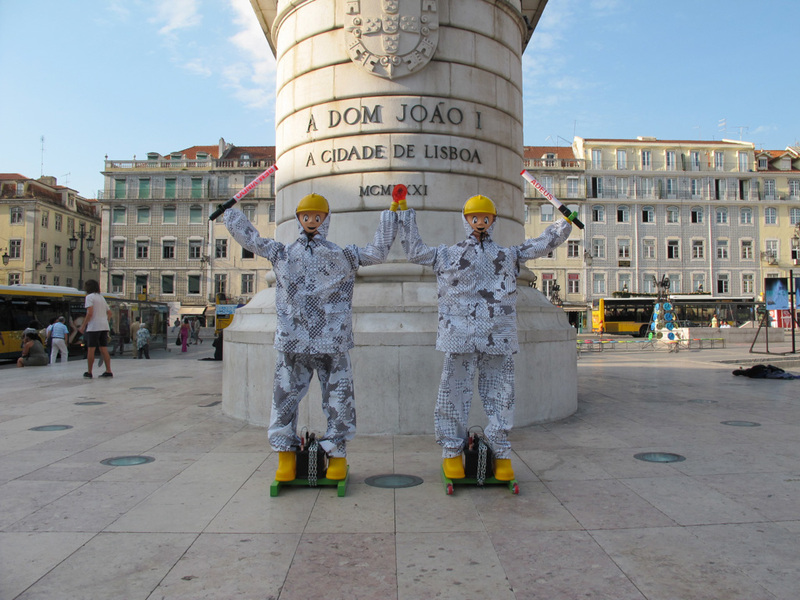 Bem-Vindo / Adeus / Bem-Vindo / Adeus (2011), commissioned for the outdoor exhibition Redundància: The Usefulness of Repetition, curated by R2 Design for the EXD’11 Biannual (Lisbon, 30 September–27 November 2011). 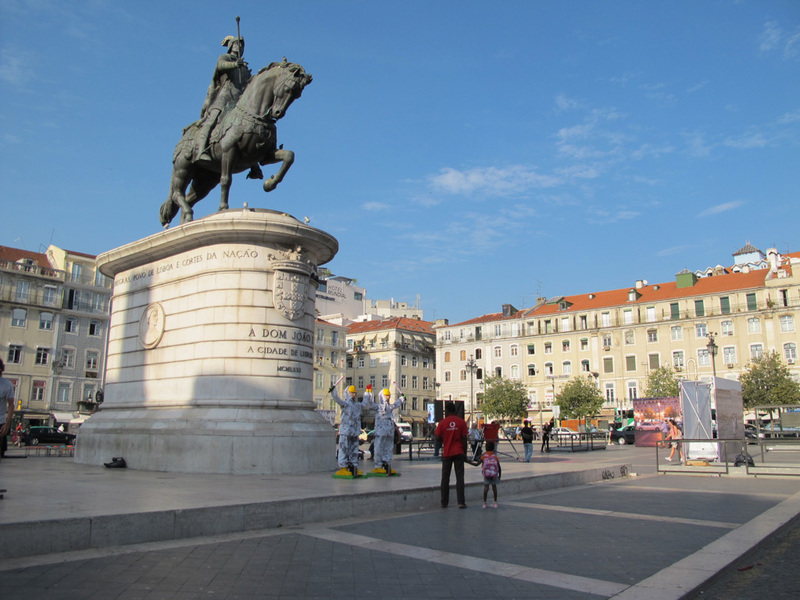 We called this piece an “automated performance” for the people around the Placa da Figueira, Lisbon. 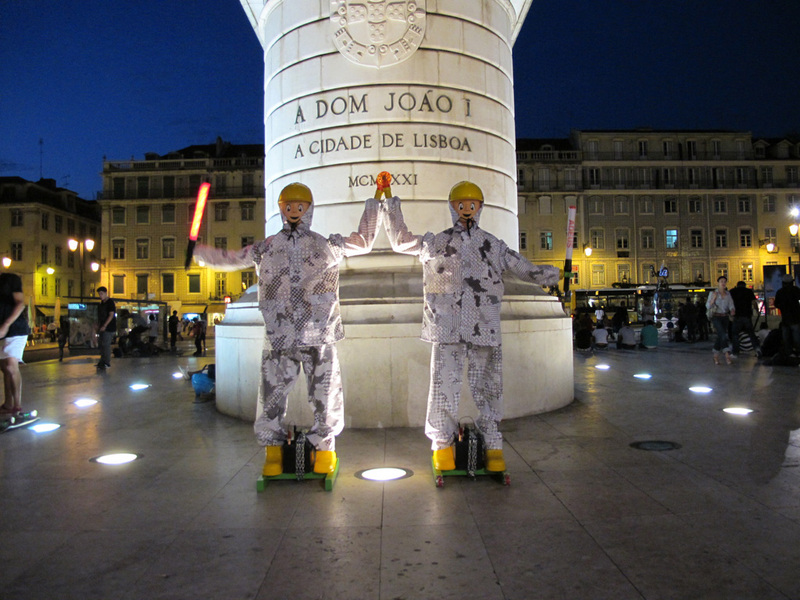 Two automatons were put to work greeting and saying good-bye to people, mechanically waving the messages “Bem-Vindo” (welcome) and “Adeus” (good-bye). The automatons, so-called “signalling robots,” are used in Korea to control traffic. 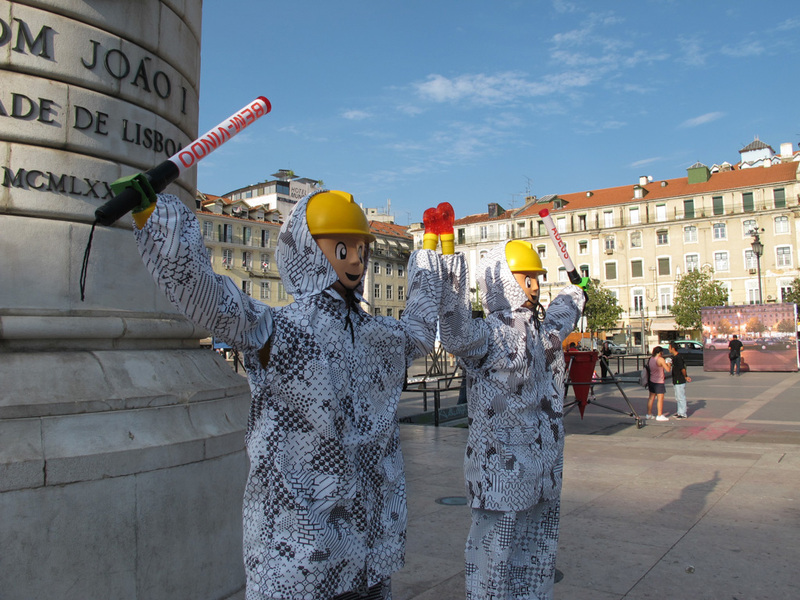 Typically, one will be dressed like a construction worker and installed on a motorway, waving a light-up stick in order to alert the drivers to a construction site or a temporary closure. As far as we know, the system was introduced quite recently: the same tedious, repetitive, and potentially dangerous tasks used to be—and in some cases still are—performed by human workers or more abstract, temporary traffic signs. It’s interesting to notice how these robots, often with an eerie smile on their faces, try not to alienate human drivers. Indeed, their presence can feel uncanny, especially when you see those that are mistakenly left alone or abandoned, yet somehow manage to continue their automatized waving movements. The signalling robots are meant to rid humans of an important yet repetitive task, allowing us to focus on more “creative” work. What if we took them out of the intended context, thus rendering their presence itself “redundant,” and put them in a new context—that is, the site of “creative” urban intervention as part of a major design biennale? The two automatons symbolically represented the two of us, and practically replaced our presence on street. The garments were designed to reflect who we are (graphic designers). We created urban-designer camouflage patterns using MacPaint Infinite Fill Patterns. MacPaint was a bitmap-based graphics painting software program released with the original Macintosh computer in 1984. Because the Mac back then couldn’t display colors, expression of tonality had to rely on bitmap patterns. Just like the signalling robots were devised to free humans of tedious, repetitive work, the Infinite Fill Patterns freed us of the infinite work of editing graphics pixel-by-pixel.